The Thailand Convention and Exhibition Bureau (TCEB) is targeting European luxury event planners with its latest campaign. Following last year’s launch of Believe in Thailand, TCEB unveiled Luxury MICE at its London roadshow, held at St Ermin’s hotel yesterday. TCEB is promoting Bangkok, Hua Hin, Chiang Mai, Phuket and Samui as ‘chic and charming’ destinations and will focus on highlighting high-end facilities, hotels and events venues. It believes the initiative will add up to 20 per cent to Thailand’s European C&I market share. TCEB president Akapol Sorasuchart said: "The luxury meetings market has grown continuously in Thailand following the global economic recession. Visitors from our long-haul markets now come in smaller groups but with higher expectations. We aim to increase spend per head during a trip from £1,240 to £1625." Elements of the Luxury MICE campaign will include a familiarization trip targeting the Russian market in June and the European region as a whole later in the year. 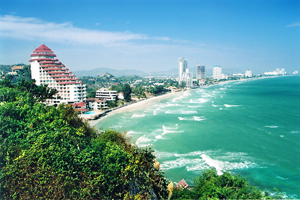 This year’s Connections Plus buyer programme will focus on Hua Hin as a luxury C&I destination.